A very attractive small Antique Walnut Writing Table by Edwards & Roberts the well know Victorian Cabinet makers of Wardour Street London. It dates from around 1880. 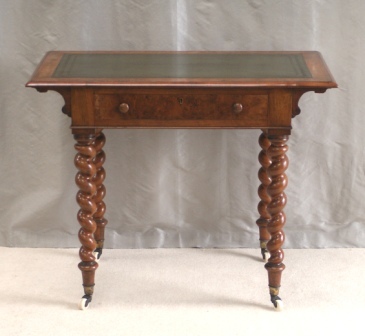 This is an exquisite burr walnut writing table with boldly turned barley-twist legs and a central drawer to the front, matched by a false drawer to the rear. It is of small proportions with the top measuring some 37" wide by 22" deep. The top has burr walnut crossbanded and moulded edges and has a dark green embossed leather writing surface inset. With original brass castors and white porcelain wheels this Antique Walnut Writing Table is a very pretty example of Edwards & Roberts work and is suitable for a number of practical and decorative uses around the home or office. Drawer top edge stamped 'Edwards & Roberts, Wardour St. London'. Width = 37" (94cm). Depth = 22" (56cm). Drawer internal height = 2.75" (6.5cm).